Papillon Bleu UK: ALICE IN WONDERLAND DAY INVITATION. In a couple of weeks will be the launch of Tim Burtons film Alice in Wonderland. I am really looking forward to seeing it as I am a great admirer of Tim Burton's work. It is fascinating to see the impact of Alice in Wonderland in people's art. 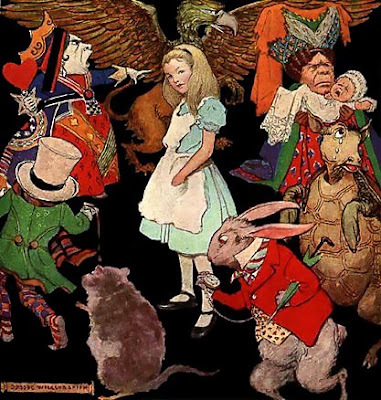 Whether we like it or not, Lewis Carroll 's none sense story and vision of childhood has inspired a great number of us. After visiting numerous blogs, I have discovered so many fascinating paintings, collages, photos reflecting how inspiring this story could be. So, I thought it would be nice if we could all focus a bit on this story and create something around this topic. Well, you can go HERE or THERE . So, how about preparing something around this topic? altogether we can make something special as we did not so long ago HERE . this time I will present everything in a slideshow. YES! you will all be the featuring stars!!! If you want to join in , just let me know by letting a comment here or you can directly contact me. You can pass on the news with a link to this post. On the 8th of March, I will make a post with links to your lovely blogs in order to create our own WONDERLAND MAZE and present the slide show. Lovely idea! I want to play Wonderland with you. I´m also looking forward to that movie. Wonderful idea, now what can I make in such a short time? Your idea's are always intriguing dear Patricia, I'll see what I can come up with! ça va être chaud pour le 1er mars, mais je vais faire mon possible !!! I have so many thing to do! But c'est trop tentant! et j'aime les challenges qui me boostent l'imagination ou me donnent l'occasion de faire des choses dont j'avais envie depuis longtemps! Le délai est un peu court mais je vais essayer! I have just finished making The Queen of Hearts, what great timing. She is not tiny that's the only problem. What can a queen do when she has nothing to make her shrink? c'est parti alors....on va rêver parmi les merveilles, chouette! Of course I want to play, but I have to think on it....what will I create???? hi! I'M ELENI FROM GREECE! I WANT TO PARTCIPATE SO IN A FEW DAYS I WILL SEND YOU A PHOTO I TOOK WITH LITTLE FIGURES I MADE FROM CLAY! I WILL SEND IT TO YOU VIA E-MAIL OK? Hey! I am finally getting around to adding your blog to my following list...Oops! I just fell in love with your Red Balloon presentation. It was truly magical. And now for Alice. I just completed reading the original story last month in preparation of he movie event. Hum...this sounds like loads of fun, I'll just have to think of something first! Hi Pat...thanks to your invitation I have a lovely little dormouse to bring to our Wonderland tea party. Hi Patricia, what a lovely idea. Unfortunately I don't have the time to make anything this time. I made a doll long time ago based on one of the characters from the book. It was fun to make. Merci pour le changement de date! C'est plus "comfy" comme ça! C'est une très bonne idée, j'aime quand tu organises de telles choses. C'est stimulant, je ne sais pas encore si je vais y participer, tout dépendra de mon inspiration. Il va falloir que je réfléchisse, cela me plairait beaucoup d'ajouter ma contribution.En même temps j'ai hâte de voir ce que les autres vont faire. "Why there's plenty of room, why, I'll just sit down right here...."
J'adoore également Tim Burton! J'attends d'ailleurs avec une grande impatience le sortie d'Alice! Ce film promet d'être une petite merveille! Patricia sur mon blog j'ai un award pour toi. Tu l'as bien mérité. Hi Patricia! I have an award for you on my blog if you would like to play along- I know you are busy making dreams so no worries if you are too busy. I am almost done with my part for Alice in Wonderland- trying to beat that deadline- so glad it's a bit longer now :) Have a wonderful day!! c'est ton amie Denise du site Web CDA. Quel beau Blog tu a et j'adore ton miniatures. Enough bad French ! Great work, I look forward to seeing more and more ! Hello !I am getting Curiouser and Curiouser!! I am so excited to do this!! I have my photos ready, so please let me know when /where I should send them??? I do hope you would like them! ... I just turned my whole house into a Alice in wonderland Valentine party!! (55 People!) Whew! it was so fun!! Cant wait for the movie!! we are going in costume!! Oh que voui on l'attend avec grande impatience ... Très joli monde !! !